Daniel Smith, a graduate student in the Department of Geology and Geophysics, and Bhart-Anjan Bhullar, assistant professor and assistant curator in geology and geophysics, have won a 2018 Vizzies People’s Choice award for photography from the National Science Foundation (NSF). The Vizzies, sponsored by NSF and Popular Science magazine, honor scientific visualizations that help create a universal language enabling people around the world to better understand scientific ideas and phenomena. 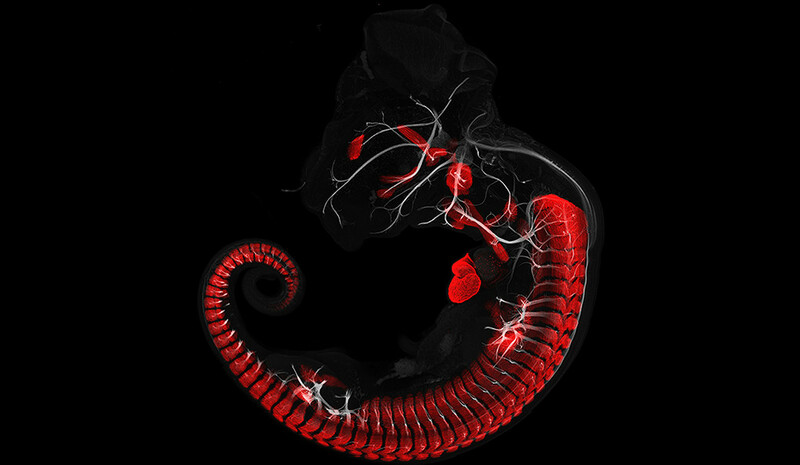 Smith and Bhullar’s winning image shows a Madagascar ground gecko embryo after 12 days of incubation in the egg. Areas in red (muscles) and grey (nerves), indicate how much development of these structures has taken place in such a short time. The image was taken by an LSM880 confocal microscope and is made up of 12,000 individual images. Confocal means the microscope draws light from only a small part of the specimen. The award comes with a cash prize of $500 and the winning image will be featured on both the NSF’s website and on PopSci.com. More information about the award can be found at the National Science Foundation website. GSAS admitted women for advanced degrees.